Porter Robinson finds Shelter in A-1 Pictures | UEM! A-1 Pictures get a lot of flak from the more ‘critical’ side of the anime community. From angst at the popularity of SAO to Youtuber Digibro’s well-documented hatred of the studio’s work, there’s a lot to debate about their artistic vision and how much commercial tunnel-vision they often suffer from, especially in their light novel adaptations. But after seeing their short film for Porter Robinson and Madeon’s song ‘Shelter’, I can no longer entertain the idea that they’re the ‘McDonald’s’ of anime. Shelter is short, but it’s no fast food meal. It’s a precious example of everything that can be done when anime deviates from its commercial angle – the kind of storytelling we saw from the video to Teddyloid’s ME!ME!ME!, from Space Patrol Lululco, Eve no Jikan and other oddball, oddly-produced projects. It combines all I’ve grown to love about Porter’s musical direction with the beauty of animated narratives which have given birth to so many experiences I’ve never had in Western storytelling, and furthermore to the sakuga community documenting the craftsmanship of the great animators we have today. 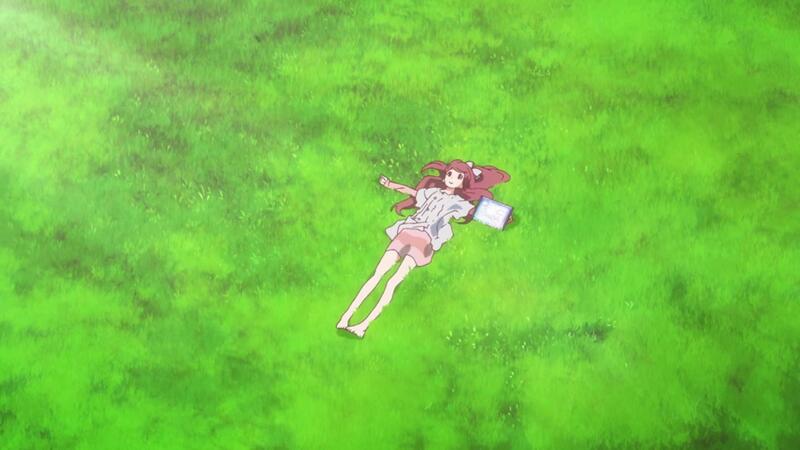 Like all good speculative science-fiction, the story of Shelter takes itself far beyond the confines of Rin’s living technological tomb. Every shot of breathtaking scenery is permeated by loneliness, as the girl either watches it all form around her pseudo-bedroom, or adventures through it barefoot, with no change from her sleep-wear. It’s a constant juxtaposition of living and sleeping, progress and death, the kind Peter Jackson’s adaptation of The Lovely Bones failed to realize by both expecting CGI to do the work of fantasy, and by using sub-par CGI on top of that. Porter understands that we relate to dreaming by how we see the dreamer; Rin’s happy apathy connects to the words of the song: how she “left behind the home that you made me but… will carry it along”. We see her both abandoning her bedroom but taking it with her, venturing into what she draws with her tablet still in hand, a constant reminder that it is all only artifice. Likewise does she take her memories wherever she goes; she can’t resist drawing her past, and all her drawings can only spring from a previous world. This populates her world with more than herself, but at the same time reminds her of her loneliness. I’m reminded of Nick Carraway in The Great Gatsby feeling both within a party, and in the position of an onlooker upon himself; both within and without. 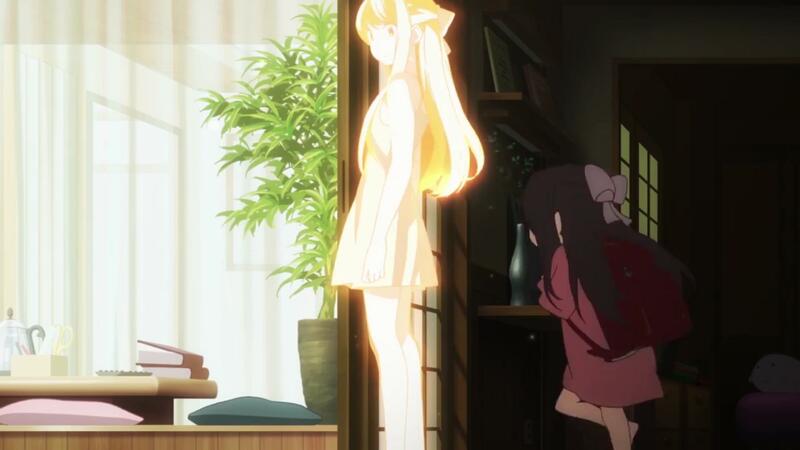 Rin feels trapped inside her world, but with shots of her father looking down upon her, it also feels like she can take the position of her protector. The words of the song ring true to this theme; remembering her father this way, she can grow up fostered by the benevolent intention to secure life, rather than waste or destroy it. It’s easy to assume the best as viewers for this moe girl, but without this memory of her father, discontent with her world could run rampant in her mind. Instead the world she is able to draw, again and again, is her father – that creative drive to preserve beauty. The pre-chorus cries, “I’ll give them shelter like you’ve done for me”, and we can agree that in some possible, reawakened future – the kind Sad Machine’s lyrics might suggest as being a sequel to this event – Rin can take humanity, or whatever it has become, along with her on her journeys of child-like celebration of aesthetic: a “hundred leaders will be born” of her father’s ingenuity having been passed down to her. The greatest fear of the post-apocalyptic is the loss of creativity; the greatest joy, perhaps, is the relic of it. But Shelter suggests that even greater – the bittersweet happiness of the story that reduced me to a tearful mess by the end – is that no matter what is destroyed from our lives, if we have the sentiment to protect creativity itself, it can be reborn from no matter what is left of the world. There’s little difference between playing with sand, scribbling on a tablet, and giving birth to a whole new world. Porter Robinson’s narrative reminds us that artistic creation comes from the simplicity of the heart of a child, and he naturalizes technology – so often the cause for an apocalypse in fiction, so often feared as a deviation or destruction of the natural in literature – into just another extension of the eternal hope we should all have: that art will remain alive. A-1 pictures give us the thrilling visual narrative needed to soberly celebrate that hope. As lacking as some viewers may have found their storytelling at times, we can’t deny how well their art executes Porter’s narrative in this musical short. In the times I haven’t enjoyed A-1’s work, I’ve always leveled it at individual staff, and not at the studio as a whole. Frequently it feels like their talents are wasted by sub-par storytellers only looking to milk a market. But Shelter is as far away from that as we can get. As I hope for the reawakening of Rin, so do I hope this marks A-1 awakening anew as well. If the animators they use devote their abilities to stories like this, that unearth fundamental human truths about ourselves and art in emotional masterstrokes, their name could be received so much better by critics at large. I look forward to more collaborations between Japanese animators and the artists they inspire. Shelter has crossed the gap between Western fans and Japan’s modern multimedia culture, and unified us all in remembering how important it is that the creative children within all of us stay scribbling forever, even if it feels like our own universes have collapsed. Fantasy exists to give hope to reality, and this short video has made me sure that we can look forward to great things from A-1, and Porter himself, in the future. Great post you made. After seeing this video, I was exposed to different phenomena of fantasy and science. I like what mentioned about the topic about the fear creativity. I noticed that when we were shown Rin expressing her creativity with her father and in order to save it, the father had to save her. With technology, the art can live. This is the projection of technology on our futures that we need right now. The speed at which all information, even the creative, flows makes us feel our mortality more deeply. But it will increasingly be through technology that we survive. Tech is no less tactile than the stroke of a pen or brush, and in a sense when we create with technology we’re even closer to what we create, using our hands, our own touch. Shelter celebrates all of that. I felt Rin’s loss and loneliness to the point of tears myself, especially that “happy apathy” you pointed out. 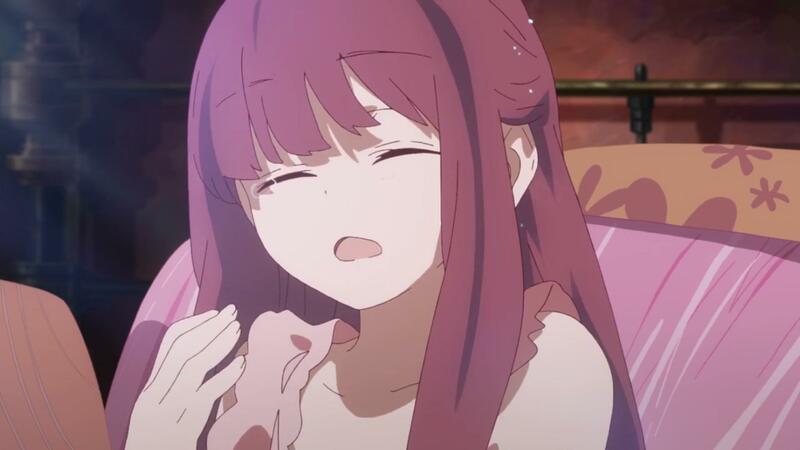 It’s like Shelter is telling us feeling that way is okay, even unavoidable in these times, as long as you create something positive and meaningful from it. That’s certainly what I’ve learned. Brilliant piece, I’ll have to watch the video again with this in mind. From Shelter, I especially enjoyed the idea that THIS IS the future of art — technology holds the key to unlocking a brand new horizon for artists and those who view that art. As you critically pointed out there, if there is a theme to be grasped from the project, it is that we must protect creativity. We absolutely must. Otherwise, we will be living in an apocalyptic world. I quite liked the Gatsby notes you made there. We are very much the viewers of the party in Shelter. I’m not sure you realize, but this short is Storyboarded and Directed by Toshifumi Akai, so the visual narrative credit mainly goes to him. Additionally, the character designs and key animation are solely carried by Megumi Kouno alone. I don’t see any mention of these two, at all. In fact, the tone of this article seems to imply it’s A-1 as a nebulous group that’s responsible for all of it. Do you realize A-1 doesn’t really employ animators, but subcontracts freelancers instead? Yes, there’s a clique of animators / directors who mainly work on A-1 projects due to the very important producer relations, but they’re still freelancers. What A-1 did here is bringing together Porter Robinson (thanks, in a big way, to Crunchyroll) and Toshifumi Akai and Megumi Kouno. You also talk about this as a huge revolutionary project for A-1 in terms of narrative. Why do you think them doing a 3-minute short will push themselves to make different kind of works that whatever they did before? The reality is A-1 will produce whatever works they’re hired to produce. They obviously can choose whether to accept or not, but they don’t really have the freedom of pursuing a specific kind of work. They did not pursue this type of story here either. If you’re looking to start talking about anime production, you should do some research first before making such wildly misleading statements. You even link to the Sakuga Blog in this very same article, and they have an article on Kouno’s animation in Shelter, and an interview to Akai! I did the research on Shelter, thanks. You’re right that ascribing the particular authorship of certain aspects to certain individuals is a formality that would have helped get my point across in some places better. However, in the absence of such mentions, I don’t believe this article is ‘misleading’. It strikes me more that you’re putting your own spin on it, trying to place it in whatever position best suits your preference for talking down to people based on the assumption that they haven’t had a staff list to hand, which critics from outside the Sakuga community will be all too familiar with. This obviously contrasts to my rhetoric of praising the studio ‘as a whole’ for this article. At no point however did I state, or imply, that A-1 has authorship over the narrative or the visual direction. I talked about what A-1 ‘give’ us, in the sense of acknowledging them as a /brand identity/, which is the faculty I think you’re ignoring in their importance to this project. You appear to be grossly incurious to what a brand identity performs to its audience. Indeed, Akai and Kouno get credit as individual artists for their individual contributions: I could have written a different article about them and their involvement. But this article is focused on the position a casual viewer takes to seeing a familiar studio involve itself in a cross-continental project that speaks of the joy of collaborative artistic design. While it must not be forgotten that Akai and Kouno made the contributions they did, as you rightly note, it must not be forgotten either that Shelter has now added to the constant reshaping of A-1’s iconography as a studio. Yes, I know they subcontract freelancers: hence my notion of ‘the animators they use’, rather than ‘their animators’, in particular. What I also know is that the audience sees ‘A-1’ and it conjures an impression: that’s what a brand is for. Someone in Cadbury’s is responsible for designing the wrappers on the bars, but when one sees those wrappers they are decoded foremost as being the product of a creative vision within Cadbury’s. Second to that would be the sense of cultural authorship. Raising awareness of the individual authorship of artists is always a good thing, but it doesn’t discount the value of appreciating brand and culture performing and being affected by a narrative’s shape and purpose. A good parallel to this can be drawn from my Anglo-Saxonist studies. There is plenty of scholarship dedicated to the (now) fact that King Arthur didn’t /actually/ translate many of things he was historically acclaimed for translating. It’s an error to support the assumption that he did in modern academia. Yet, it is also an error to neglect the impact that the illusion and iconography of ‘a King Alfred translation’ had on its audience, who were told by their King that their King had turned ‘word for word, sense for sense’, Latin into English. His name on the products of Anglo-Saxon intellectual milieu is still an important stamp on the history of those texts. I wonder what you believe the importance of a studio’s identity on a product to be, given that you seem to take pleasure in discounting every notion of value to what is positioned at the forefront of the sense viewers get of anime production. Ultimately it should be acknowledged that this article is about anime /reception/, not about production. It can be said that are two chief critical angles to take to an artistic product: one looks to expose the system of how a work was produced, while another looks to expose the mechanics of how a work is recieved. I could have woven both discussions into one article – the difference between the image Shelter creates of its creators and the actuality of them – but I feared that the piece would become too convoluted, and off track from my optimistic, journalistic position of trying to praise what I see as a rising strand of cross-continental collaboration on the global ‘mukokuseki’ fantasyscape of the anime industry, which I feel Shelter is a microcosm of in many ways. It isn’t misleading to point out that the success of Shelter has shaped A-1’s brand identity in some fashion. That brand identity creates, as you note, a greater sense of autonomy of artistic path than may be permitted for the artists in actuality. But while you tear down that identity, with your criticism dedicated to exposing the system, I think the iconography should remain in their viewer’s eye: it’s a vital component in the joy found in engaging with a commercial, collaborative venture. Brands are always somewhat misleading: that’s the only way business can be done. This article has simply joined hands with what I see the brand of A-1 as possibly speaking of today. But I will, in the future, try to weave more specifics about staff, to satisfy readers like yourself that have a desire for sensitivity to the authorial identities of anime. Unfortunately, I see by your Twitter you’re not coming into this comment section in good faith. Apologies, but I’m not going to ‘stop writing’. Your criticism here is in many places valid and it would reflect professionalism in yourself far more if you had at least attempted to come across as constructive on social media, and keep your discourse fixed on critical comments rather than drama-baiting your followers. If you ever come to wonder why the Sakuga community alienates many anime fans, your approach here should offer an ample case study. Your concern for an omission of authorial details is apt, but your singlemindedness on the (outdated) auteurism you find essential to every discussion of the significance of an anime studio, and the abrasive attitude you take to anyone perceiving the presentation of a cinematic narrative from a different angle, will be lost on many critics outside of your circle.